Less than a week ago I posted a call for input on my proposal to build a Test Driven Development Framework for Vala and feedback has been slowly trickling in. You can see a summary here which has also been distilled into a Trello board which will become the Product Backlog and Product Roadmap. The list is looking fairly complete so far, so I figure I'm just about ready to close it off and work on a Release Plan. Then I can finally start writing code! Phew. The requirements gathered so far are pretty much in line with other testing frameworks, but here's a good time to review our Product Vision again and see if we're heading in the right direction. I've highlighted the parts of the statement which correspond to features so we can compare. So far so good! 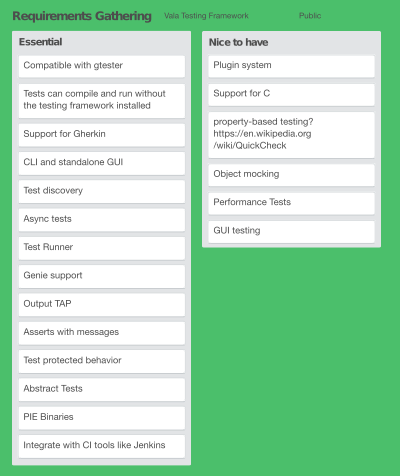 Of course, this is an Agile project, so this list is not exhaustive or final and we can expect some features to be added and others modified or removed altogether. The important thing is that our features align with our vision. The result of this prioritization process will be the Product Roadmap and the Product Backlog, which will guide sprints and daily development efforts and inform the release schedule. Before we do that though, we need some guidance on how to break these features up into functional areas which will determine how we structure our code base and where to start writing our tests. To do this we need a System Architecture. One of the misconceptions that newcomers to TDD have is that you don't write any code until you've written a test for it. This leaves many people new to the concept scratching their heads about where to start, as even creating a simple command line application requires a certain amount of boilerplate code to be written before you can even start processing the user's input. At this point, a lot of beginners may inadvertently write reams of redundant tests, start reinventing already well tested wheels or just give up on TDD altogether. There are very few times when your code will be executing without any dependencies (if only libc) so you will almost always be coding within an existing framework, if only loosely. Most of these interactions with other frameworks should be encapsulated in integration tests which are developed in parallel with the unit tests. The tests which inform our system design are those which test its unique features. Our System Architecture defines these interactions and boundaries and gives us a basic skeleton upon which to start laying down a codebase. Once this is in place, we can start writing actual tests. Thanks Bill. I'm still not 100% sold on Valadate, even though it does reflect the Product Vision of being made especially for Vala and that it's not strictly limited to unit testing. Calling it VUnit would reflect its XUnit origins, but it's not like there's any rigid API to conform to. Technically it doesn't matter at this stage of development, but I would like to avoid having to refactor the code later just to change the name. There's still some more work that can done before laying down any code, so I'll let it percolate for a day or two longer before making a firm decision. Now's a good a time as any to speak up if you feel passionately one way or the other. The base was designed by misirlou and I added the nice colors. It's meant to symbolize the eponymous asteroid that gives Vala its name. That's all for now, tune in again soon when I discuss the Roadmap and Backlog as well as how I set up Jenkins CI on a Raspberry Pi.